Elevated Mexican coastal seafood and chic craft cocktails in Studio City. 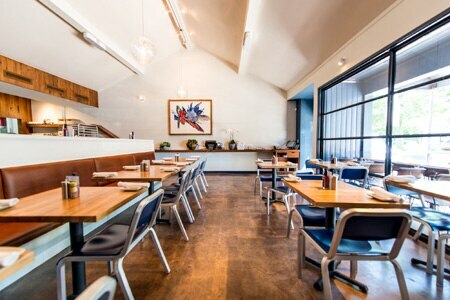 : Yxta Cocina Mexicana and Mercado partners Jesse Gomez and chef Jose Acevedo’s third concept is a charming, ambitious Mexican seafood restaurant in Studio City. Designed by Ana Henton with nautical inspiration, two dining rooms lined in wood allude to the hull and cabin of a ship. Contemporary art adorns the walls, and the atmosphere is light and airy. A lively sidewalk patio is a pleasant spot to sip passionfruit margaritas rimmed with black lava salt. 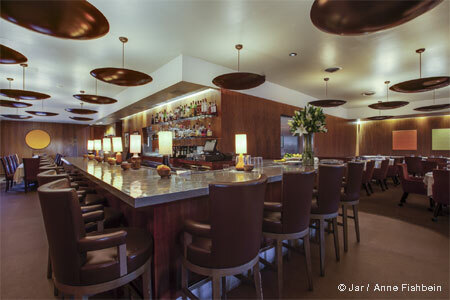 At Maradentro, Acevedo brings his menu to a higher level of contemporary Mexican cuisine. Lobster guacamole’s inspired take on a ubiquitous classic offers chunks of sweet lobster and Nueske’s bacon that lend structure and depth. Oysters “Rajafeller” riffs on another classic, combining strips of grilled poblano chiles with spinach and queso anejo, for a good balance of flavors. Lobster tacos may lack excitement, but seafood fans shouldn’t miss the chile relleno de siete mares, a deconstructed cross between the traditional stuffed chile and a cioppino. It’s filled with plump shellfish and tender fish --- don’t forget to sop up the rich poblano-tomato seafood broth with grilled ciabatta. For dessert, the chef’s signature flan hits the spot.